We offer a guaranteed shade improvement of 2–6 shades in as little as 15 minutes. Quickly and easily remove surface stains caused by coffee, wine and tobacco. The “wow” factor is undeniable. Book an appointment below to love your smile, every single day. Business Bright is our custom teeth whitening package and we come to you! 85% of people say that a smile is the first thing they notice. Teeth whitening is a simple cosmetic procedure when done right. 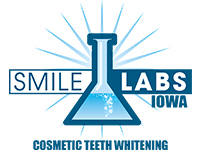 Smile Labs Iowa provides maximum and safe teeth whitening by using 16% hydrogen peroxide gel when accelerated with our Infiniti Pro SL Laser light which processes the photosensitive whitening gel. Our cosmetic whitening treatment is considered by industry insiders to be the best.